You are here: Abbey Labels Ltd > News > Happy Birthday Francis! Our very own 007 has now turned 070 and what better way to celebrate our Sales Director, Francis Milne’s birthday, than with a cake that James Bond himself would be proud of. Not many people are aware that our very own Francis appeared in the classic James Bond film ‘You Only Live twice’. He played one of ‘Q’’s henchman, assembling the autogyro ‘Little Nellie’ in front of ‘Q’ and of course James Bond himself (Sean Connery). Francis with his special cake courtesy of the team at Abbey Labels. 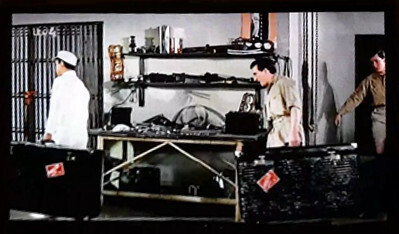 Our Francis in Action in the classic 1967 Bond film ‘You Only Live Twice’. Did you know that before venturing into the world of labels, Francis even had his own pilot’s licence, flying autogyro’s like ‘Little Nellie’ himself! So Happy 70th Birthday Francis, a prestigious and ever inspiring team leader!